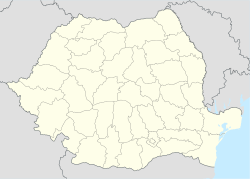 Location o Danube Delta in Romania. The Danube Delta (Romanie: Delta Dunării pronounced [ˈdelta ˈdunərij] ( listen); Ukrainian: Дельта Дунаю, Deľta Dunayu, Ukrainian pronunciation: [dɛlʲˈtɑ dunɑˈju]) is the seicont lairgest river delta in Europe, efter the Volga Delta, an is the best preserved on the continent. This page wis last eeditit on 20 Januar 2018, at 20:32.